The average pizzeria uses roughly 55 pizza boxes per day..
On Super Bowl Sunday, pizza delivery drivers can expect $2 tips to sometimes soar as high as $20. Domino's delivery drivers will log about 4 million miles on Super Bowl Sunday. Delivery sales of pizza spike the most during close Super Bowl games. The largest pizza ever made was 122 ft. 8 in. in diameter. The pizza needed 9,920 lb of flour, 198 lb of salt, 3968 lb of cheese, and 1,984 lb of tomato puree. Italian is the most popular type of Ethnic food in America. Domino's Pizza is the world leader in delivery. Regular thin crust is most popular in America, it is preferred by 61% of the population, 14% prefer deep-dish, and 11% prefer extra thin crust. 62% of Americans prefer meat toppings while 38% prefer vegetables. Pizza Hut has 12,583 stores in over 90 countries. During TV news, pizza is most often ordered during the weather. There is a Pizza Expo held every year in Las Vegas, Nevada. Pizzerias represent 17% of all restaurants. The world's fastest pizza maker can make 14 pizza in 2 minutes and 35 seconds. 36% of people consider pizza the perfect breakfast. 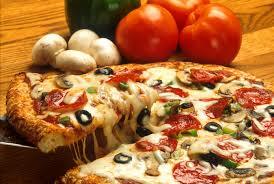 Eating pizza once a week can reduce the risk of esophageal cancer. In Italy there is a bill before Parliament to safeguard the traditional Italian pizza, specifying permissible ingredients and methods of processing (e.g., excluding frozen pizzas). Only pizzas which followed these guidelines could be called "traditional Italian pizzas", at least in Italy. The largest pizza ever made was at the Norwood Pick 'n Pay Hypermarket in Johannesburg, South Africa. According to the Guinness Book of Records the pizza was 37.4 meters in diameter and was made using 500 kg of flour, 800 kg of cheese and 900 kg of tomato puree. This was accomplished on December 8, 1990. What has been called "the world's most extravagant pizza" is available at New York's Nino's Bellissima restaurant. Topped with six varieties of caviar, chives, fresh lobster and creme fraiche, this 12-inch pie, called the "Luxury Pizza," retails at $1,000.00 (or $125.00 a slice).